A cars emblem or is often quite boring and dull. But not those mounted on classic Chevrolet Corvette´s. Especially American cars made in the sixties and seventies has gorgeous details in their emblem. The sporty Corvette has a number of different logos or emblems. Many of them are very beautiful. This is definitely one of the best looking ones. 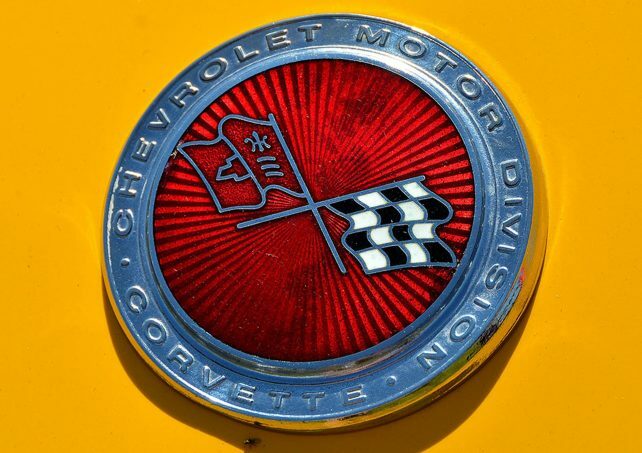 This nose emblem rests firmly on the hood of a very nice, bright yellow Corvette Stingray from 1973. It’s the first emblem with the so called sunburst design. It has the crossed flags, is made of cloisonne enamel and is fitted with a very nice typography. I think it’s a little masterpiece. But there is one Corvette emblem thats even more beautiful. I will post that one later.